Activity in England’s dockyards reached intense levels during the French Revolutionary and Napoleonic Wars. The Royal Navy Dockyard at Chatham in Kent was no exception. During the first decade of the 19th century it played a vital role in shipbuilding and maintenance, albeit a less prominent one than it had in earlier centuries. In addition to officers and shipwrights, over a thousand craftsmen and laborers called the base home. The navy’s need for victuals grew as well and the butcher Thomas Waghorn prospered. 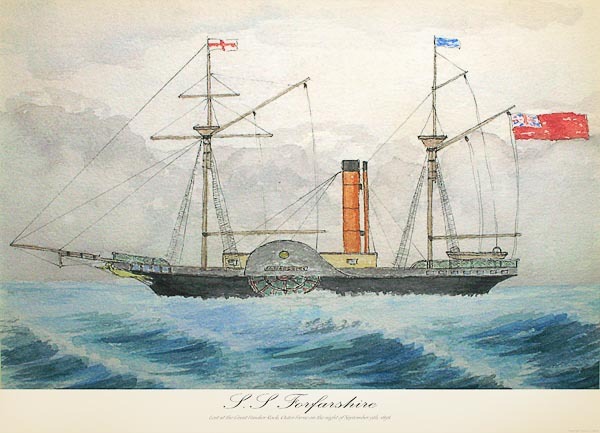 This dynamic world of ships and suppliers produced another of the late Georgian/early Victorian period’s great creative individuals, Thomas Fletcher Waghorn, the butcher’s son. Thomas Fletcher Waghorn entered the Royal Navy as a midshipman at age 12 and served until discharged in 1817. With the Napoleonic Wars over, the Royal Navy and the world of his childhood had shrunk. Waghorn tried his hand as a merchant seaman. In 1820 he joined the Bengal Pilot Service in Calcutta, left it briefly to serve in the First Burmese War, and returned to duty. During this period, while still in his twenties, Waghorn became interested in steam-powered travel. English mills had developed an insatiable need for raw materials. The old sea route by sail around the Africa no longer met the demands of trade. The need for faster communication became obvious to Waghorn as well, and his obsession with speed began. He took leave of absence when the Bengal Steam Fund, a merchants’ organization authorized him to speak on their behalf in London in 1825. Their idea, encouraged by Waghorn was to convince the government to raise the mail rate to pay for steam passage around Africa. He found little interest in the postal service for changing a rate that in any case had to be set by Parliament. Waghorn decided to return to Calcutta via the ancient route through Egypt, one that had virtually ceased to be used once the Portuguese opened the sea route around Africa. 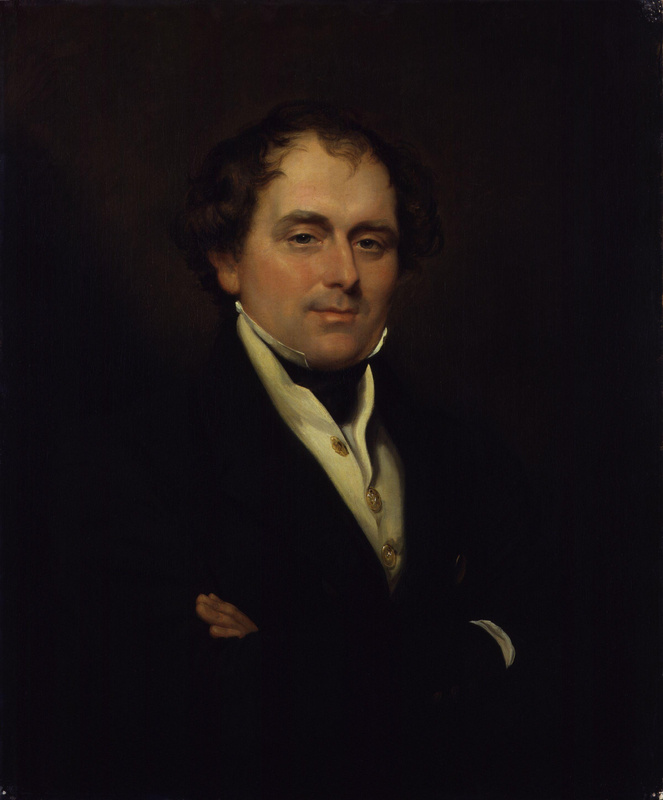 He managed to secure an appointment with Lord Ellenborough, Chairman of the East India Company, during which Waghorn claimed he could deliver the mail to India in 90 days. Ellenborough told him the steamer Enterprise was scheduled to make a trial run from Bombay to Suez, and offered him a courier’s passport. 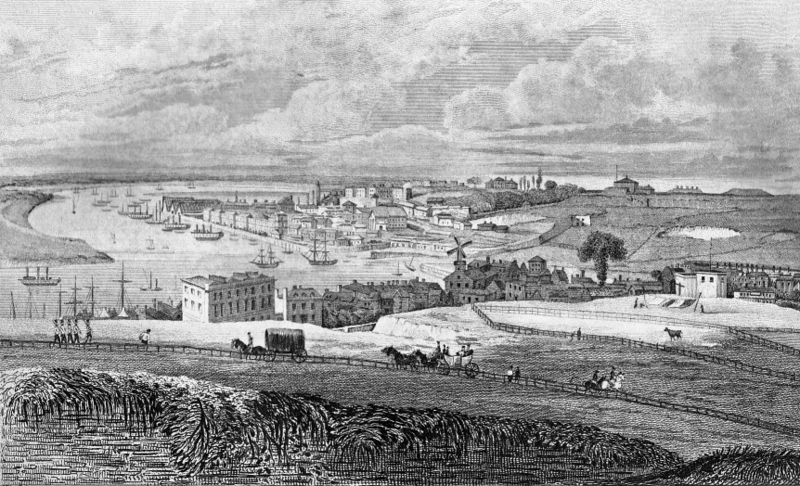 Waghorn left London in October 1829 with dispatches for Bombay determined to prove his point. He actually went by coach to Trieste, setting a record when he arrived in nine days. He delivered the London Times to the British Counsel, who was soon demanding to know why the mail typically took fourteen days. Speed had become a central issue for some officials at least. Waghorn then begged, borrowed, and patched together transport to Suez via Alexandria, the Nile, and Cairo, but got to Suez to find that the Enterprise had not arrived. It had broken down. He persisted, embarking down the Red Sea in an open boat. He arrived in Bombay four months and twenty-one days after he left London. It was a record, but not 90 days. He would not give up. Waghorn now saw the overland route via Suez to Cairo as the best way to go. He returned to work, but spent the next few years trying to drum up support for his ideas. There were a number of barriers. Officials of the East India Company bureaucracy and army may have been content to keep London at arms length, content with communication that took a year or more to complete. The government had other issues. The Eastern Question, the issue of stability in the Ottoman Empire, occupied diplomacy. Then as now distrust of Russia’s interests in the Middle East led them to shore up weak governments for fear of Russian aggression in case of a power vacuum. 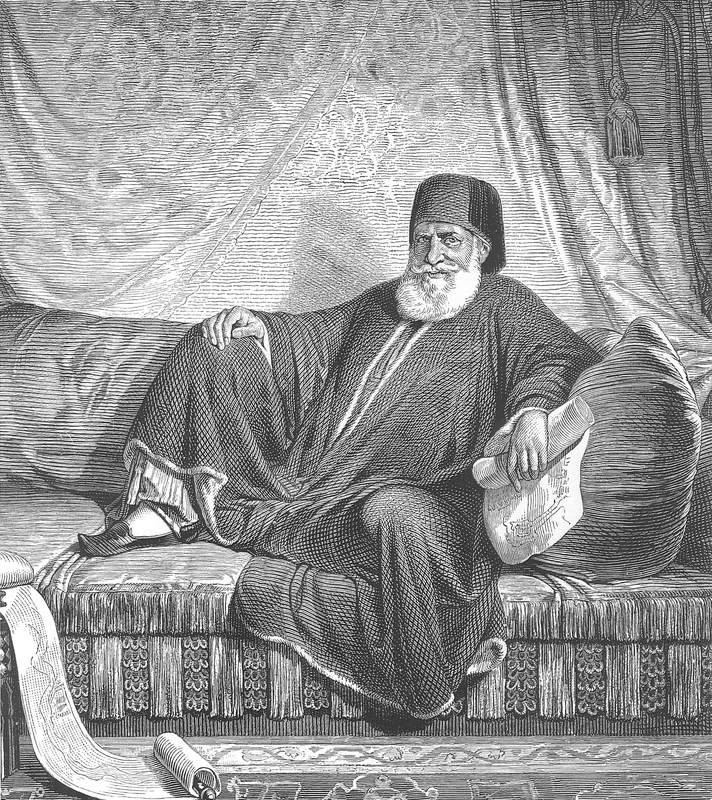 They viewed Muhammad Ali Pasha, a talented and ambitious Albanian who had become the Ottoman governor of Egypt with suspicion. Neither the government nor the Company had much stomach for the diplomatic issues surrounding a route through Egypt. Waghorn had little patience with politics. When ordered back to his post in the Pilot Service, he replied with a letter of resignation. He made friends with the Pasha, convincing him that there was money to be made through cooperation. He lived with Arabs and camel traders, and began to find solutions to problems one by one. Docks, refueling, passenger services, bandits, or caravan routes: he simply let nothing stand in his way. One big issue was coal and the refueling of vessels. 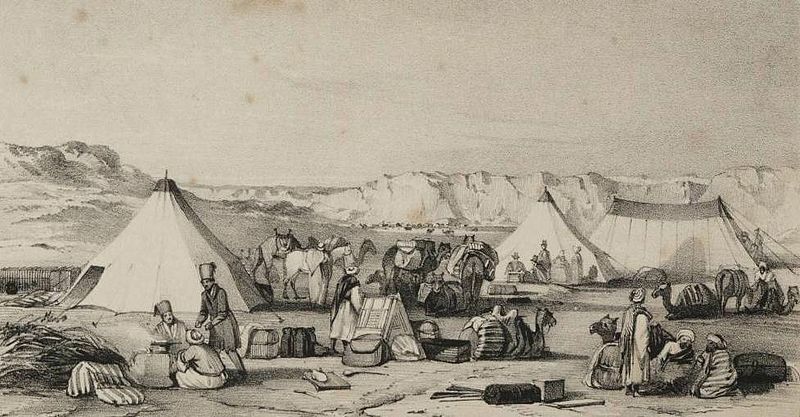 Waghorn shipped coal for steamships from England to Alexandria, down the Mahmudieh Canal to the Nile on native vessels and from there to Cairo where it went by caravan to Suez. It drove the cost of coal at Suez down from £20 to just over £4 per ton. Having accomplished that, he sent the mail—and eventually passengers—back the same way. By 1835 he had the contract to ship mail via the overland route. In 1837 the butcher’s son was appointed counsel to Egypt. Eventually journey time had been reduced to thirty-five to forty days between England and India and ads for “Waghorn’s Overland Route,” appeared in publications regularly. It didn’t last. Others quickly saw the opportunities he had opened. Agents of the Bombay Steam Company, Hill and Raven, set up a competing company, building a hotel in Cairo and desert rest stations. By 1840 the Peninsular and Oriental Company monopolized steam service. By 1841 Waghorn had to merge his operations with Hill and Raven. In 1842 Muhammad Ali Pasha bought them out and created the Egyptian Transit Company, a government agency. Between 1831 and 1842 by sheer stubborn force of will and personality, he fought to create what become the vital route between Europe and the East, one so vital it eventually resulted in creation of the Suez Canal, but he lost control of it. 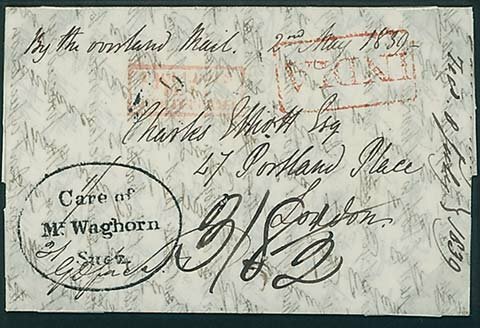 In later life Waghorn turned his attention to other overland mail routes via rail. The government was not always forthcoming with promised reimbursement. Waghorn died in 1850, bitter and deeply in debt. Recognition came too late. John Brinton’s excellent article on Waghorn in Aramco World (Vol. 19, No.6, November/December 1968) is available online. Caroline Warfield writes historical romance. In addition to History Imagined, she contributes regularly to The Teatime Tattler, a fictional Regency gossip news-sheet. The characters in her latest novel, The Reluctant Wife take The Overland Route, or as Meghal Wheatly age six called it “the way with camels” for their return to England. The book is part of Caroline’s series, Children of Empire, stories of two brothers and their cousin torn apart by lies and deception, who struggle to find their way home from the far reaches of the Empire. It continues to amaze me that so many geniuses who are ahead of their time die in poverty. Great post, Caroline. I agree, Becky. I’m also surprised at the number of figures I’ve found who came from really modest backgrounds. I agree, Caroline and Becky. Achievement is not always recognized or rewarded until too late for the originator to see any benefit from his/her efforts. Think of all the great artists and musicians who left the world far better than they found it through the gift of their talent, yet so many never made a consistent living from their work. Very interesting post, as always, Caroline!